Browse your music library for the next song (or album) you want to play. Tap the song’s Action Overflow. The Play Music app adds the song to the list of tunes to play next. Songs are added to the queue in the order you tap them. That is, unless you instead choose the Play Next command in Step 3, in which case the tune is inserted next-in-line in the queue. To review the queue, tap the Song Queue icon, shown here. The queue is shown in the following figure. Songs in the queue play in order, top down. 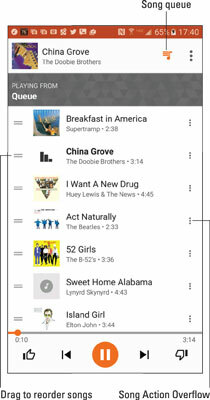 To change the order, drag a song card up or down. To remove a song from the queue, swipe its card left or right. If you like your queue, consider making a playlist of those same songs.